Power-over-Ethernet (PoE) technology brings simplicity and cost-savings to network deployment for all size of businesses. With more and more devices capable of receiving power over Ethernet, the PoE switches that can provide power to these end devices are in high demand. Traditional PoE switches come with high port density and are not flexible or optimized for small scale deployments. Users will end up with many unused ports. 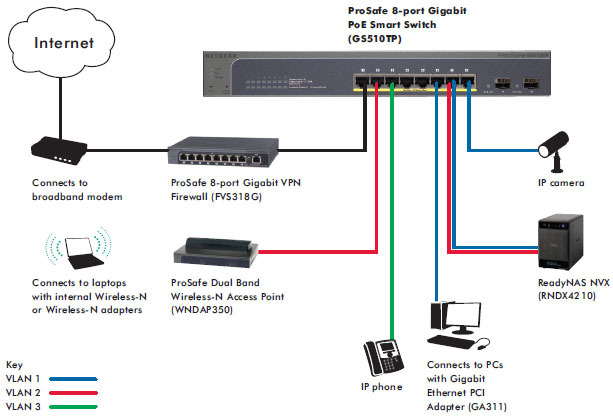 The Netgear ProSafe GS510TP provides a compact solution that fits nicely into a situation where low-port density is desired for specific areas or extension of the network. It comes with 8 PoE-capable Gigabit copper ports to connect to your PoE end devices and two additional dedicated Gigabit Fiber ports for uplinks with greater distance. Plus, with the PoE Plus support, GS510TP is able to provide sufficient power for those power-hungry devices with up to 30w per port with a total power budget of 130w on the switch. GS510TP is packed with powerful features capable of enhancing any type of business network. The GS510TP comes with a comprehensive set of features, such as enhanced VLAN and QoS, access control lists (ACL), 802.1x port authentication, rate limiting and IGMP snooping and many more, to provide businesses with networks that are geared for growth while ensuring performance and reliability. Download the NETGEAR GS510TP Datasheet (PDF).